Many J Street employees are on edge after Sodexo told their labor union that the company needs to lay off two workers. Despite a $20 million budget shortfall, the University said they aren't cutting catering services. After J Street workers received an email from Sodexo that layoffs were inevitable because of GW-mandated cutbacks, officials say the University is actually not trimming catering services. Sodexo told UNITE HERE, which represents J Street employees, that the company will have to lay off two workers and overhaul the catering department’s structure. 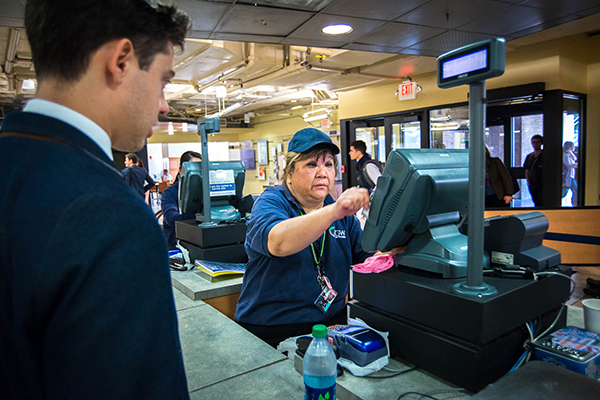 Though the University has scaled back spending after a $20 million budget shortfall last year, Senior Associate Vice President for Operations Alicia Knight said GW isn’t formally cutting back catering services. Knight said departments across campus had been asked to cut costs, but that no order to discontinue catering services had been made. She emphasized that Sodexo and the University are two separate entities, and said GW has not told the company to make changes to the dining program or fire any employees. “Sodexo is responsible for managing the dining operations and makes its own independent business decisions on matters such as staffing levels and work schedules that the University is not a party to,” Knight said. The Sodexo email, sent to union representatives in December, stated that starting Jan. 12, the two employees who work at the Simply-To-Go market section of J Street will be fired. The email also stated that Sodexo would only give catering jobs to its most senior employees, placing others on standby as needed. Previously, there had been a separate catering staff. Sarah Jacobson, the lead organizer of UNITE HERE, said none of the changes or firings have yet been made. Jacobson said she has not heard from Sodexo officials since the email, but she has asked them whether the company will continue to cater GW events and how many workers will be laid off. Jacobson said she worries it’s just a matter of time until she hears about layoffs, since Sodexo has followed through on their email directives in the past. “The company told us they were going to do these layoffs. Normally, they go ahead and do it. We’re trying to tell them, ‘The way you’re doing it is wrong. You’re not respecting the time and years [J Street employees] spent working,'” Jacobson said. Last year, Sodexo cut workers’ hours from 40 hours a week to 30 and laid off about 10 employees, several workers said. Jacobson said she knows changes are coming, but that she cannot formally file grievances against the company until action is taken. While she is waiting to hear back, Jacobson has worked with the GW Progressive Student Union to build support across campus for J Street workers. After they were contacted by the union at the end of last semester, Cavan Kharrazian, a member of the Progressive Student Union’s coordinating committee, said the group’s members immediately posted a petition online to spread the word about what was happening. As of Monday, the petition had received 650 signatures from students, faculty, staff, workers and some community activists. Though the directive did not come from the University, Kharrazian said it should be held accountable because the decisions GW makes internally trickle down and affect Sodexo employee’s jobs. “We believe that mismanagement on the side of GW’s administration should not have to fall on the backs of community members that have been here for a long time and are part of our community,” Kharrazian said. The Progressive Student Union has a history of supporting J Street and Pelham Commons workers on campus: They’ve worked together during several strikes as recently as last February, and they rallied in front of then-D.C. Mayor Vincent Gray’s office last fall in support of higher wages for local workers. Kharrazian said his organization is trying to create momentum through the petition and gather student support.